Apple to Reissue The Beatles USB? Is Apple doing a limited reissue of The Beatles Stereo USB? The UK online store Spin CDs has just listed it, with a release date of 30 October…… Details on their site are sketchy so if anyone else knows about this let us know. 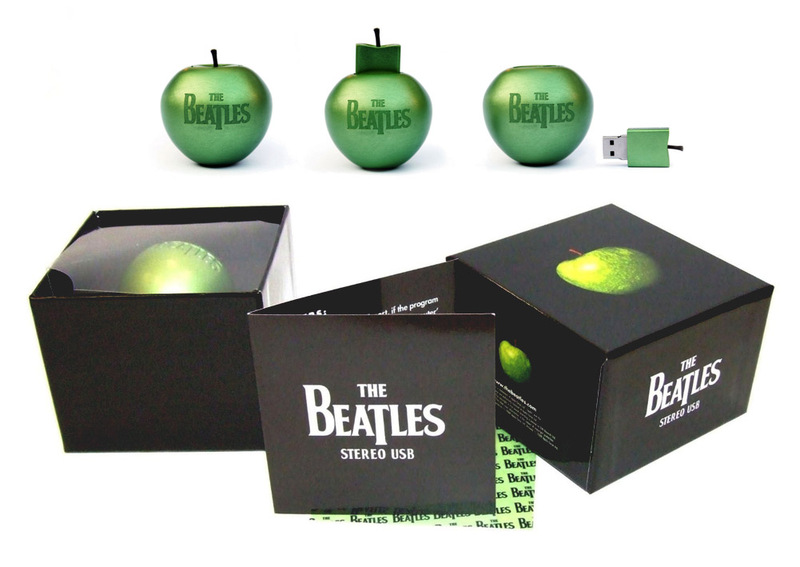 Originally issued in December, 2009 as a limited edition of 30,000 units, the small metal Apple contains a USB drive with all 13 of the band’s studio albums, plus all the Past Masters songs. Also included are the 13 album mini-documentaries which came with the remastered CDs, and the complete digital booklet artwork. The USB has all songs in stereo in both FLAC format (24 bit 44.1 kbps) and MP3 (320 kbps). This entry was posted in Apple, Beatles, Beatles Collecting, Beatles Music and tagged Apple Records, Beatles, Beatles Collecting, Beatles Stereo USB, Music by beatlesblogger. Bookmark the permalink. I can testify that for the audiofile Beatles fans, the USB is well worth it. I only listen to The Beatles in 24 bit FLAC now on my home sound system. I can hear things that I have never heard before in their music. Why oh why oh why do Apple insist upon relasing the stereo versions of the Beatles albums, the majority of which are inferior to the ‘original’ mono cuts? With the exception of Abbey Road the Beatles albums were meant to be heard in Mono. They were not “meant to be heard in mono”. If they were, they would have recorded them in mono. They were recorded and mixed for stereo, sometimes very inventively (“Strawberry Fields” or “A Day in the Life” for example), and it’s because stereo was so popular that mono completely died out. Otherwise, it would still be around. You may prefer mono – that’s your choice – most of us don’t. I don’t mean to burst your bubble, Terry, but friend you are wrong. Sgt pepper was recorded engineered and produced in mono by Marin and the Beatles just like every album preceding it. The stereo mix was given to Geoff Emerick to mix and he did it in a matter of hours. I think the prime example of how stereo loses the Beatles in translation is how in the chorus of ‘Lucy in the Sky with Diamonds’, when both John and Paul are singing, their vocals are clean from effect bringing in a moment of clarity. But in the original mono version the chorus vocals are even more phased and psychedelic than john’s trippy verses, which feels like a moment of peaking rather than the moment of clarity. and for some weird reason Emerick decided to speed up the playback of the song on the stereo mix which is a shame because after the chorus when the Beatles sing “ahhhhhhhhh-hhhhhhhh” it hits so trippier and heavier in mono. Often the Beatles produced their music in mono on two track or a four track recording method for most of their career. When the Beatles made stereo mixes (for America) they hastily split the tape tracks equally into two channel stereo. The problem with this is that you’re not re-engineering these sounds for stereo presentation, so suddenly instruments that had to be overdubbed and built up to have a presence amongst everything in mono–now in stereo these sounds are naked and this is where you get awful lopsided mixes where a cowbell or a tambourine can be just as loud as a lead vocal–think Mccartney’s bridge in “a hard days night” vs that cowbell that sounds like will farrell was in on the session. Another failure of stereo is that splitting the tracks means separating the harmonies from the lead vocals, which ruins the magic of songs like “nowhere man” and most every iconic song from their early years. I am personally not against stereo, I would love it if they were to go back and give the albums from ‘please please me’ to ‘the white album’ a proper stereo engineered mix, that would be fantastic, but until then the mono mixes rock harder, have better balance, and are fuller mixes. “I will” which sounds glorious in mono.